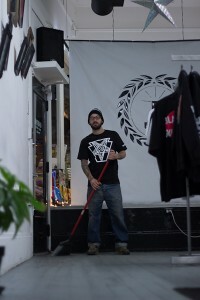 For the winter tee shirt collection lookbook we decided give you some insight into how Bobby ends his busy days at the shop by snapping a few pics. New to the collection is the Blasfome Pesticide Tee. 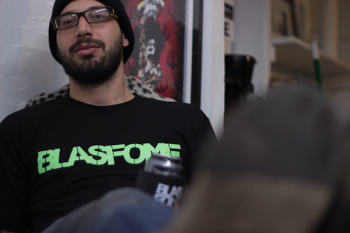 The Blasfome Pesticide Tee features a can of Blasfome Pesticide printed on the lower front right of the shirt boasting a few “pests” Blasfome is guaranteed to keep away. and a dead bug and Blasfome branding on the back. Making a reappearance in the winter collection are the Blasfome Keystone Hate Tee in the black and white color way. We also revisited the Blasfome Logo Tee in Grinich Green for all of you stingy assholes out there. The Blasfome Winter T-shirt Collection is available for purchase in-store and online on Black Friday for you Psycho Shoppers.